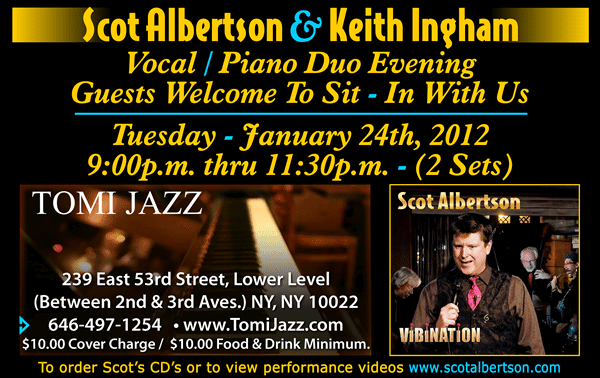 Vocalist Scot Albertson appears at Tomi Jazz tonight, Tuesday January 24, in a duo performance with pianist Keith Ingham. This is the first of three performances by Scot at Tomi Jazz through February – with upcoming performances on February 7 and February 28. Tomi Jazz is located at 239 East 53rd Street (between 2nd and 3rd Avenues), NYC. Dates: $10.00 Cover & $10.00 Food & Drink Minimum please. "Tomi Jazz celebrated their One Year Anniversary last November," Scot says. "I’ve been there now 15 months monthly along with other artists & musicians who perform there regularly. It was originally a private Club with Owners Ken & Mutsuki opening it up to a public venue providing Jazz 6 (six) days a week (not on Sundays at this point in time). I’m performing there twice a month sculpting the performances with different musicians each time to develop growth and an opportunity for a venue for other musicians to promote and share their music. We simply come together to have fun and make music. Guests are always welcome to sit in when we’re performing. The relationship between Ken & Mutsuki and myself is based on trust & mutual respect which is refreshing in these trying times." Guest musicians have been: Arthur Lipner – Vibes, Sedric Choukroun – Sax & Flute, Mayu Saeki – Flute, Nick Demopolous – Guitar, Freddie Bryant – Guitar, Daryl Kojak – Pianist, Dr. Joe Utterback – Pianist, Keith Ingham - Pianist & Kyoko Oyobe – Pianist. 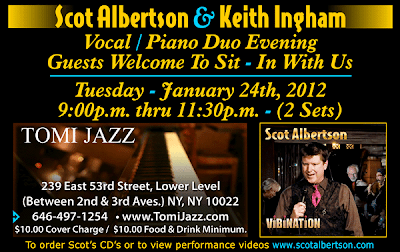 Feb. 28th Tues. – Scot Albertson & David Pearl Duo – Piano / Vocal Duo Evening. All dates are 9:00 PM thru 11:30 PM time slots which usually go beyond 11:30 PM. "Although the time slot is structured as 2 sets in that time frame indicating a break between sets, I don’t break meaning once we start, we go until we finish @ 11:30 PM or later accommodating all who attend to sit in with us," Scot states. UPCOMING: Baruch Performing Arts Center – Friday May 11th @ 7:30p.m. The 15 month run In Tomi Jazz started after a 3 year run of multiple performances in the Laurie Beechman Dinner Theatre (West 42nd St. & 9th Avenue – NYC) & multiple performances in The Kitano after Scot’s debut there June 17, 2009. Scot’s most recent CD "Vibination" – his fifth - was released on June 17, 2010. Scot’s new CD will be recorded later in 2012.